Small Town Noir is dedicated to recovering the life stories behind mug shots from the vanished golden age of one American town. The men and women in these mug shots are nobody special, but they saw things that none of us will ever see. They were all arrested in New Castle, a small town in western Pennsylvania, right over by the Ohio border. It was once one of the most industrially productive cities in America, but all that’s gone now. 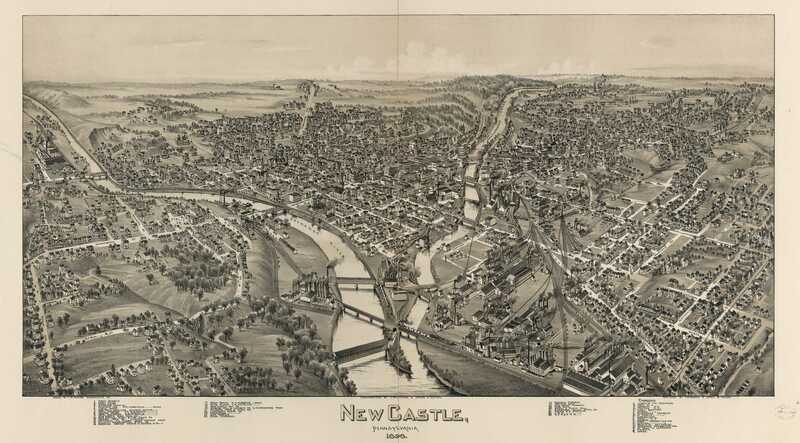 At the beginning of the 20th century, New Castle was a boom town – its population almost tripled between 1890 and 1900 as thousands of immigrants from Europe and across America arrived to work in its tin plate mills, steel factories, ceramics works, foundries and paper mills. The depression of the 1930s hit the town as hard as anywhere else, but world war two and the Korean war kept its manufacturing base going. The population peaked at 48,834 in 1950, but it was downhill from there. Today, around 28,000 people live in New Castle. The unemployment rate is twice the national average. The mug shots on this site date from the 1930s to the 1950s – from the temporary slump of the great depression to the terminal slump that followed Korea. Those decades also happen to correspond to the classic era of American crime cinema, from the Warner Brothers gangster movies of the 1930s to the noirs of the 1940s and 1950s, and the faces in the photographs wouldn’t look out of place in the background of any thriller from Little Caesar in 1931 to Touch of Evil in 1958. I write another blog, The Unsung Joe. It’s about unknown extras and bit-part players in old Hollywood films — the kind of people who played the waiters, the cab drivers, the passers-by in the street. It’s surprising how much you can find out about them, about their hopes for their careers, about their disappointments, their tragedies and their joys. Then again, they lived in Hollywood at a time when it was the centre of the imaginative life of most of the western world, and anything that happened there was reported in gossip columns, magazines and newspapers wherever English was spoken. That was never the case with New Castle. However, the New Castle News – the local paper, still going today – diligently recorded the goings-on in the town and made sure that its readers knew who had visited whose house for dinner, who had been sent to war, who had drunkenly crashed their car, who had gone to jail. The record is patchy, of course, but it’s possible to piece together some of the stories of the people who were arrested all those decades ago and, in doing so, catch a glimpse of what life was like in that long-gone town. I was surprised to see a photo (mugshot) of my grandfather, Louis DeLuria here. Can you please tell me how you came about this information, and the story that goes with the photo? I would greatly appreciate any information you can supply. Thank You. Thanks for getting in touch. It’s always wonderful to hear from a relative of one of the people I’ve researched! I’ll e-mail you with the full newspaper stories that mention your grandfather. I read the article about Lewis Morphy. He had 2 other children with my aunt Edith. Pat was born in 1928 and was listed in the 1930 census as part of my grandparents household along with her mother and father . this was in Dayton, Tn, I have an old picture/flyer of Lewis and Boots in their western outfits with I believe Boots has a rifle by her side. I wish I could contact Valerie or Lewis Jr. if either one is still living to give this to them. I wish I could help, Peg, but I can’t find any trace of either of them. Keep on trying — I’m sure they’d want to see the flyer. Dear Peg, I knew Boots Kaye and the children in Laurel Canyon in the 50’s. I was born in 1942 Boots entrusted me with calling the studios to see if she had work! It’s very sad about Valery and Lewis Jr. I was disappointed that Diamid couldn’t find more information … I was 18 yrs. old living in the San Fernando Valley when I saw the headline that Lewis had done what he did I wasn’t surprised just sad for the children… I hope that somehow they turned out okay. Wow. I am just now seeing this on May 9, 2017. I am fb friend with Morphy Mike (Lewis Jr.) He lives in Belize and spends time in the states . Valerie is a sculptor and seems to be doing ok.You can contact me on fb. I have been a fan on Flickr for a year or so, and now I can become a fan of the blog. Your writing is clear, concise, and powerful; your research is top-notch; and your heart is always open. A respectful journey into, as you say yourself, things that none of us will ever see. Thanks, Kendall. Very good of you to drop by – it’s always good to know someone’s reading this stuff! Michael – I’d love it if you were to use any of these stories in fiction of any sort. Feel free! I Love your blog. As someone who does a lot of reading,enjoys good writing and attempts to write some himself the twists your stories take are inspiring. That’s really great to hear, Rick. Thanks! Thanks very much for all the work that must go into this blog. It’s one of my favorites! Really? That’s excellent! Keep dropping by; there’s lots more unfortunates still to come – I’ve got an interesting selection of female transgressors that I’ll post over the coming weeks in the interests of evening up the gender balance around here. Thanks for saying you like the stories. Fascinating stuff! Are you from New Castle? If not how did you manage to choose my hometown for your blog? It’s rumored that there is a lot of mob and gangster history in New Castle. Have you ever run into that? My uncle, who died some years ago, once told me of an incident in New Castle, which he said many believed involved Bonnie and Clyde. Supposedly, they were stopped by police, but fled successfully. He was an armed guard at a mill, and he said he heard about it through law enforcement connections. Have you ever heard that one before? PS I’m enjoying your comments. That blew my mind, but just for a minute. It looks like the arrest cards that are attached to each mug shot, but I reckon it’s actually an all-points-bulletin or be-on-the-lookout card. The dates (1926 and 1929) on the card are intriguing, though. 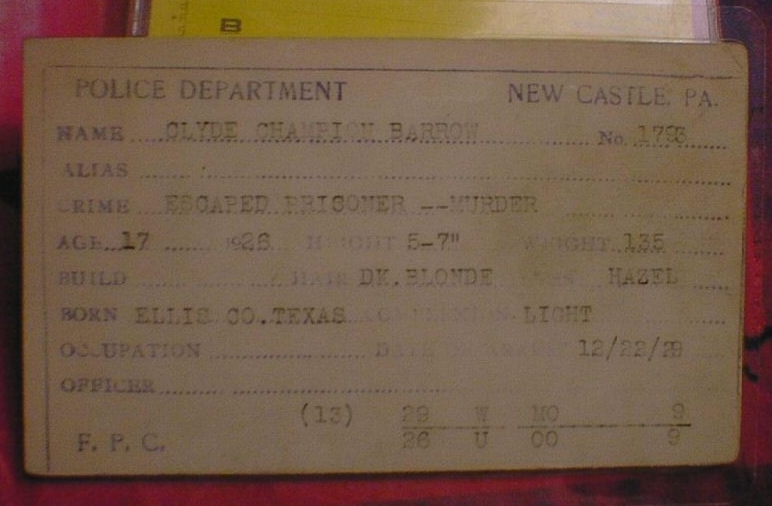 I wouldn’t have thought Clyde Barrow would have been wanted for murder that early in his life. I don’t know, though – I’m no a Bonnie and Clyde expert. There is an historical marker along the Old State Road in Shenango Township on New Castle’s east side that commemorates a shoot out between police and some gang passing thru maybe in the 20s? We used to stop and look at it when we passed by on our bicycles. I never got the whole story but rumour was it was Bonnie and Clyde. I will try and get a photo next time I am home to visit. Glenn Dague and Irene Schroeder, from WV I think, my Brother and I were just talking about that a couple days ago…They got the electric chair, their son just died a few years back. I’m not from New Castle; I’m from Scotland. I’ve ended up writing about the town mostly by chance – the mug shots from New Castle that you can buy online tend to come with complete arrest information, and the New Castle News archive is full of all sorts of details about the lives of the old townspeople, criminals and regular folks alike. As I started to research the stories, I got more and more interested in New Castle’s history, and finally decided it would make a great theme for a blog. As for the mob, yes, I found out some stuff in connection with the mug shots of a couple of Italian guys, which I’ll publish later on. If I remember correctly, they were tangled up in numbers running and that sort of thing rather than anything to do with narcotics or violence. I’m a french art student living in Brussels. I’d like to thank you for the blog and I ‘d like to know about the status of these mug shot. I’m looking for this type of mug shots for a work, so I’d like to know if the site content is protected or free of rights. You can contact me for further informations. Thom – thanks for writing. I’ll e-mail you to talk about your ideas, but, essentially, you’re welcome to use the photographs in your art. Of course, I’d appreciate it if you were to credit Small Town Noir and/or Diarmid Mogg as the source. I’m looking forward to seeing what you do! I’ve written you before, long ago, to express my appreciation for Unsung Joe. It is and has always been one of my favorite blogs and I look forward to each entry. Somehow I’d missed the start of smalltownnoir, but I’m looking forward to reading the posts. Most especially because I have a consulting client in New Castle and have spent quite a bit of time there. Thank you for all your hard work. Thanks for dropping by, Rob – it’s an honour to have you. hello there diarmid, my name is carlos and just wanted to say that i looove your blog/site,its very addicting,i still have to check the unsung joe one,thanks for all your research, i find all this kind of stuff fascinating,had one question,are some of the articles without mug shots or is there something wrong with my computer? thanks again for posting these great stories!!!! great site, fascinating stories that brings to light stories we would never normally hear, and people who would normally be forgotten. and you bring a good sense of understandingn and insight that gives the town and its people some dimensions. Suprisingly you are not even from small town America. Thanks very much. I have a box full of these photographs, so I should be able to keep them coming for a while yet. Glad you’re enjoying them. Love this blog! Just found it. I’m from Greensburg Pennsylvania originally, but now live in Ireland (and working as a photographer). You have a great way of writing these people’s stories in a film noir fashion. It should be a book! Thanks, Lisa. You’re very kind. I hope your memories of Pennsylvania are nothing like the stories I’ve been writing about! Thank you for this blog. It’s the closest thing to time travel going; history you can project your imagination into. Once we pulled down a wall in a house and found a newspaper article printed ninety years earlier to the week, a report of a woman who walked into Boston common and slit her wrist. The article hinted at a fall into poverty and despair. This blog gives me the same sensation as that discovery, a connection to the past through empathy and the human condition. Sean – I know what you mean about that strange feeling you can get from awful old stories that you stumble across. I’m glad this blog is giving you some of that. Thanks very much for writing. Great articles. You have referenced my late father, Police George S. Sigler from the NCPD in numerous articles. My father was an officer with the NCPD from 1936 until 1966, when he became Sheriff of Lawrence County. He served as Sheriff from 1966 until retirement in 1989. My mother, Mary Jane Sigler was also an officer with the NCPD from 37 years, retiring in the late 1980’s. Bette – I’m very glad you wrote. I keep coming across your parents in old copies of the New Castle News and I’d wondered whether they were married, so it’s good to have that confirmed! I expect George will feature in many more stories. I’m pretty sure there are a few mug shot stories that I’ve done some preliminary research on where he, rather than the person who was arrested, is the most interesting character. This is an amazing site ! It is unbelievable what people will throw away. I have sent a link to some of my old New Castle buddies. Great job!!! Thanks Scott! It’s always good to hear from someone with connections to New Castle – I figure that, if they like the stories, I’m probably on the right track. Thanks for putting this together. Good job and I look forward to future posts. Thanks, John. There’s plenty more to come! I just discovered Small Town Noir as well as Unsung Joe. I love it! I have read every last word of both blogs and look forward to reading more. I notice that you haven’t updated Unsung Joe since late last year. Any chance you’ll be picking this up again? Small Town Noir will continue to be updated every Thursday, like normal. Got some good ones coming up. Thanks again for writing. It means a lot. I can not find news about a plane crash on the south side of New Castle. It was in the mid 50’s on Hamilton St. A plane crashed into a General Store. I hope you can help me find a news article or something. The owner of the store, Walter Wasilewski, and the only customer at the time, a Mrs Bockum, went outside when they heard the noise of the plane’s engines and were standing by the building when the plane hit it. They were uninjured. Apparently, several thousand people jammed the streets near the scene of the crash, hampering the rescue and fire-fighting operations. Were you one of them? I’ll e-mail you the PDFs of the newspaper pages. Thanks for alerting me to the story! I remember the evening it happened and my dad (USAF man) wanted to go see what it was about . (WKST made it well kown that it had just happened.) We got into the neighborhood, but realizrd we would be in the way and didn’t try to get close, so went back home. I remember the news paper headlines, but was young then. If you have NC News articles, I would love to see them. Thanks for the post! ED, I googled New Castle News plane crash 1956. I found articles but the only New Castle News article I received was from Diarmid in a PDF file. Hi Diarmid. I just read the article about you in the New Castle News today. it was very interesting and led me to this site. I was a young boy and playing ball in the street with my friends when we saw the plane go down. We ran to the crash scene to get a closer look. One of the pilots who parachuted out of the plane landed in a ballfield where my brother-in law was playing softball. Hi! Glad you dropped by after reading the article! I visited the site of the plane crash when I was in New Castle – it seems that nothing was ever built on the plot after the crash. I saw the old steps that must have led up to the front door of the store. It must have been quite something to see it happen as a little kid! This is not a response to this post, but to your project in general, which I think is terrific. Winesburg, Ohio by Sherwood Anderson (which is really about Clyde, Ohio, home of Whirlpool washing machines). and Bruce Springsteen’s ‘Nebraska’, to name a few. In any case, good luck with this. I hope it flourishes. Hi John. Thanks for the encouragement. It means a lot, coming from you. And thanks very much indeed for pointing me towards Edgar Lee Masters! I’d come across Winesburg, Ohio (when I was looking for some writing that might help me to get a flavour of life in the part of the world I was writing about, before I visited New Castle), but I’d never heard of the Spoon River Anthology. I downloaded it last night, and I can’t believe nobody mentioned it to me before. It’s quite brilliant. Wish I wrote that well. I know the Wasilewski family very well and my father has told me this story several times. I guess it would have made quite an impression on anyone who was around then, wouldn’t it? I came across your blog while researching the death of my grandfather, George J. Shellogg. He lived his whole life in New Castle, PA. He died in early 1956 … I think around March. Our family always claimed that his death was an unsolved murder. He was a New Castle fireman, he worked on the railroad, and he owned a small “mom and pop” grocery store near the old fire station downdown. He lived on Delaware Ave. on the North Hill. The story goes that he was working as a switchman on the railroad early one Sunday morning. When he failed to pick-up my grandmother, Frances Shellogg, for church that morning, she reported him missing. The police found him dead by the railroad switching station. The family always contended that he was killed for his money by someone who was riding the rails. When the police found his body, his cash was missing (money that my grandmother had given him that very morning), and he had blunt force trauma to the head. Would you have access to any police or newspaper reports that would describe this incident? I would be most appreciative. Hi John. I’ve read about the Shellogg case in papers from that year, and I would tend to agree with you that George was attacked. I’ll find the relevant pages and email the PDFs to you early next week. I am a fan of your unsung joe site. I read your last entry with the link to this site. What a great idea and entertaining content. Thanks. Good to see you, Marc! Glad you like it here, and thanks for dropping by! enjoyed your blog great reading..
Hi John – I haven’t come across that case at all. I’m still traveling in the USA, but I’ll check it out when I get home and see if it connects to any of my mug shots. Thanks for telling me about it! Sorry I missed your visit to New Castle. There is an interesting news story concerning the shooting of a New Castle police officer in the 1930’s that I would like to share if you are interested. I’ve done extensive research on the officer and I have managed to obtain his badge among other items. Your blog is very interesting and well done and I have enjoyed visiting. Neither of those well known stories sorry to say but headlines none the less. I’ll fill you in completely via email when you are home. Excellent! I’ll email you when I get back to Scotland. I still remember the night that may Dad was arrested. Before he and his buddy turned themselves in for the 1961 string of Burglaries, he gave me a small red plaster piggy bank and told me that if I worked hard and saved all of my money I could have anything that I wanted in my life. He passed away in 2004 and is buried as a veteran. He was given the job of being a “nurse” in the prison infirmary while incarcerated and was released early never to be incarcerated again. He accepted the fact that “If you do the crime, you will do the time, nothing in life is free”. My Mother never recovered from the mental stress of those times. She suffered many years with severe mental illness and died 20 years ago as an organ donor extending life for two people with her kidneys. My red piggy bank crashed to the floor one day but I have saved, became a Psychiatric Nurse and remembered that nothing in life is free, there is always a price to pay. Can you forward me the information that you uncovered about the burglaries from 3 Aug 1961, 4 Aug 1961, 11 Sep 1961, and 25 Oct 1961 Penitentiary. Thank You, Thomas Williams Jr.
Thomas – thanks so much for sharing that story with me. It’s remarkable. I’d be glad to send you the articles I’ve found. I’m still in the USA just now, but I’ll email you when I get home. Diarmid – Thank you greatly for your kindness of sharing your research efforts with me. I have always intended to do this research myself, but I never got around to it. Little Tommy Jr. also may have also appeared in your search as he was hit by a car on Long avenue on his way to school that September 1961 – while his father was in jail. I’m glad that you did something creative with the mug shots that you obtained. There must have been a multi county release of this type old information as I had seen a similar auction for mug shots from Beaver County (south of Lawrence) on Ebay some time ago. I also find these things interesting and wonder about the past lives and what became of these people. I have a set of photos picked up at a yard sale that cover a number of years spent in Africa during the 40’s by a missionary woman – quite an interesting time in the Congo. I hope that you will continue to enjoy your interests. Best regards Thomas E Williams Jr. I love this blog!! I’ve always been really interested in old photos, clothing, books etc..This makes it all come to life. I’m going to add this page to my favorites and tell my friends about it. I’ve lived in New Castle almost my entire life and as you were telling the stories – I was picturing the streets and sights of some of these places. I think it would be fantastic to contribute to this. I haven’t looked through all the pages yet but did you write anything about the murder swamp? Thanks for sharing all the stories you found!! Love that someone is interested in these old stories. Is this West Pittsburgh area of New Castle talked about in this article? This is amazing. I think your work is very powerful on a global historical level. Very important. Thank you for saving this. Very kind words. I really appreciate them. Hi Diarmid…I wrote to you once and told you my great grandpa was gene buckley, the night desk sergeant who wrote so creatively about the crimes, criminals,and new castle. Sorry I missed you in new castle. Where did you say I could find entries in the police record from him? He was there about 20 years but it was beginning in1907 or so, before most of the crimes/mug shots I am finding now. Thanks if you could help me find it! Diarmid – what a unique and mesmerizing blog! I stumbled across it just today. The images and stories are like parting a veil and entering into another world. It’s hard stop reading! I’m a professional editorial illustrator. I also collect vintage photographs (including a small collection of mug shots) and I occasionally including them in my work. I am currently working with an animator, we are combining talents to create moving illustrations. Would you be willing to grant us permission to use some of your posted images in the experimental work we are doing? You can see some of my work at my site http://www.mattwood.net – I am based in Colorado. Every face tells a story… what a great place to come for creative inspiration! Thanks for writing. I’ll get in touch and we can sort something out. Your blog is one of my favorite things to read. Your research is the standard of excellence, but your story telling makes this a work of art. I truly love the stories that carry on after the event of the crime – such as going on to be a war hero or growing old with no other incident, or even the ones that get into more trouble. You allow me to follow someones life and see into their souls. Thank you for providing me many hours of enjoyment! Thanks again for writing. I really appreciate it. Wonderful project! My name is Dennis Mohr from Toronto, Canada. I’m friends with Mark Michaelson and producing an independent documentary film about mugshot photography. I’m wondering if I can talk to you more about the project? I’ll e-mail you later on tonight. Speak to you soon! I’m writing to ask your permission to use some of these mugshots as the basis for an art project I’m working on – please email me and I’ll let you know more details. I will of course credit you, your site, and send you a copy of what I eventually do. Thank you for this fascinating and darkly beautiful pics! Hi Zoe – Thanks. I’ll e-mail you later today. Now this is impressive. No sarcasm here, either. Underrated, and not nearly as known as it should be, I feel not unlike a moneyless vagrant desperately longing for an overly-priced candy bar, then stumbling upon a winning lottery ticket someone tossed away. thanks for the cool site, and the incredible efforts to create/maintain/expand its rule of the www roost. Now a question: Are there any similar endeavors known, regarding Somerset County, PA, and specifically, the town of Windber? Stunning site. A treat beyond words. Hi Rich — that’s a fine colourful lot of praise indeed! Thanks very much! great blog! very interesting! where do you get your sources from? I would love to read the articles of the dates at the bottom of the blog about Ross Paswell. how do I locate each of those articles? thanks! Awesome blog! I’m from New Castle and currently live here. One small suggestion I have is the inclusion of the WordPress Search widget. It would be a very useful tool. Keep up the good work! Thanks, Dave. Good idea – I’ve added a search box in the side bar. Hope it helps! Congratulations on such a fantastic blog! It’s rare to find such a combination of well presented research and vintage mug shots. I wanted to touch base because I am the PA Commissioning Editor with The History Press – a traditional publisher of local and regional histories. You might be familiar with some of our titles in the region such as “Kill for Thrill” by Michael Sheetz and ” Legends & Lore of Western Pennsylvania” by Thomas White. I’d be very interested in speaking with you about doing a book based on your blog. Please feel free to shoot me an email, and we’ll keep the conversation going. Thanks Hannah. I’d love to talk to you. I’ll send you an e-mail later today. Your site celebrates the best and worst in the rest of us. Forget Hollywood. Thanks, John. Who needs Hollywood when you’ve got New Castle PA? I was in contact with you in late 2009 regarding my grandfather, Frank Siegel. You mentioned you may be doing a book. Has this happened? Could you shoot me an email as I am still in China. Blogs and different web sites tend to get blocked; as an example, I can’t access the photos on your blog. Hi Frank! Good to hear from you again. Hope everything’s going well with you. Yep, the book is coming along — I’m waiting to hear back from people about it… I’ll e-mail you later on today. Hi Diarmid – really love the exhibition in the Filmhouse right now, the images are very striking and so, so interesting. Fabulous, congratulations. hey diarmid,this is carlos, i ended up clearing my cache and cookies and that seemed to solve the problem that i was having about not being able to see some of the pictures on your site, thanks for the tip earlier!! the pictures are a absolute must when reading the story. I’m blown away by this amazing blog. Cool photos and interesting storys. Great job! This site is very interesting. I was working on my ancestory when I found my great uncle on this site. I saw his mugshot and although he was quite young, I remember him clearly. My father never told me his story but I am not surprised. I didn’t know New Castle was this exciting. I was born there and moved away when I was a child but I lived with my grandparents every summer so it was like home Keep up the wonderful work. First, I would like to thank you for your work. I think this is a very interesting blog. I was wondering if you had any interest in learning more about the cold cases of New Castle? My father told me growing up that New Castle has been known for many unsolved murder cases and at one time, it made national news as a town to “get away with murder.” I am curious if you have any interest or if you’ve come across this part of New Castle’s history? Rachel, thanks for writing. Always good to hear from a New Castleite and, yes, I’m very interested in learning about New Castle’s cold cases. I’ve also heard that the town had quite a reputation for unsolved murders. Whether that’s true or not, I can’t say. There are a few really interesting cases, though. There’s John Blevins, the city treasurer, who was murdered in his office in January 1899. All kinds of suspects were suggested, but no one was caught. My theory is that the killing was connected in some way to the fact that someone (Blevins himself, perhaps) had been syphoning off a load of cash from the city’s treasury. Blevins died just before a visit from an external auditor, who would have no doubt denounced Blevins. Was he killed to prevent him implicating someone else? Also interesting is New Castle’s murder swamp, which you’ve probably heard about, which was where, in the twenties, headless bodies would be discovered from time to time. There was a suggestion that they might be connected to the Cleveland Torso murders. My guess is that they were something to do with bootlegger turf wars, but that’s based on nothing but a feeling. However, because of the strictures that I’ve imposed on myself in the writing of this blog, I can only write about those cases, and others like them, if I can find some link (however tenuous!) to one of the mug shots, and I haven’t been able to do so yet. I’d love it if it turned out that some old guy who had his mug shot taken for being drunk and disorderly in the thirties had been identified as a suspect in, say, the Blevins murder when he was a young man. But, so far, that elusive link has yet to emerge. I came across this webpage about the notorious Mad Butcher of Cleveland. It includes the mention of a place called “Murder Swamp” located near New Castle. An interesting coincidence! I just stumbled across your blog and wanted to leave you a note to say I think it is remarkable. I really appreciate how much effort it must take to research each individual’s records. I’m really interested in history and genealogy so I find these stories fascinating! Thanks for doing this and sharing it with us. I saw an article on Slate earlier today concerning your blog and I just spent the last 3 hours reading it. It was a great way to spend the afternoon. A couple of years ago, your site had a mugshot of John Dagres, John the Greek. My family was never sure if this was my great-grandfather since the photo didn’t look quite like him and we’d never heard of him getting into any trouble. Now, my mother was cleaning out an old cedar chest and found the letter from 1931 that he wrote from prison to my grandmother who was about 10 years old at the time. The letter is endearing and a little comical because you can tell he must’ve been in some very hot water with my great-grandmother! Thank you for giving us a piece of our family history. Keep up the great work! Diarmid: A very interesting site. You’ve had a great deal of fun with these and done some interesting research fleshing the people out. I have other New Castle mugs, that appeared on ebay at one time or another, as well as mugs from various other places. And I think we know some of the same people in the collecting world. Hi John – i recognise the name wsidejack in your email address. is it the same as your ebay identity? If so, I think we engaged in some bidding wars a few years ago, before eBay anonymised the process. Could that be right? Pretty sure you always won! Diarmid: Sorry, just saw this reply today. You probably saw my post below. Yes, back in the day we probably bid against each other on ebay. My ebay handle is wsidejack. I LOVE what you are doing so much. There is something so beautiful about sharing other peoples’ stories. From the mugshots to the background movie actors… love it. You are an inspiration to this young writer. That’s very good to hear, Katie. It’s great to hear when people get what I’m doing with all of this stuff. So glad you appreciate it! Do you mind if I write an article about you and what you do on my blog? Of course! I’d be honoured. Hi joseph, Thanks for writing. I think the only person from Sharon I’ve written about is William Fabian (https://smalltownnoir.com/2010/12/29/william-fabian-burglary-7-jan-1942/). He lived there when he was a kid, in the ’30s, but he moved to New Castle later on. Doubtless other characters were from Sharon (or spent time there) but I don’t know for sure. I don’t have any Grandes in my collection, however, so you’re safe! I grew up in New Castle in the sixties but I now live in St. Louis, Missouri. I am just completing a trilogy set in New Castle in the late sixties. There is no genre but it is a little bit of everything: noir, mystery, action, romance, detective, etc. I grew up hanging out on the streets and soaked up a lot of the local lore during that period. If you are interested in the Amazon link, let me know. I know a person who just retired from the New Castle police. She was a homicide detective and worked there during the ‘80’s and ‘90’ when New Castle experienced a high crime rate. Hi Bruce. I’d love to read what you’ve written – please send the Amazon link! I’m in the process of updating my covers so it should be, at the most, about a week before I get things right on Amazon so you can order it. But here is my author’s link. The portraits are the new covers but the price is screwed up. Excellent. I’m looking forward to reading the books. Thanks for letting me know about them! I come from a small town (15,000 in the late 60s) in NWPA that has a rich history which includes Zippo Manufacturing. For being situated far from any big city, we’ve had some of the strangest murders I’ve ever heard of. I think crimes have a lot to do with the gloom and doom mentality in depressed communities. Although there have been booms, most were still poor country folks. You may be able to get lots of info by contacting ‘The Bradford Era’. ( http://www.bradfordera.com/news/ ) I’m sure they have news dating way back and I have personally seen many photos from the 30s, 40s and on thru. I don’t think the public library has ever thrown anything away, as I’m sure the same is true of many city gov offices. We had many famous characters such as Tullah Hanley who lived on the square. Frankly, it was a weird place to grow up. I stumbled upon this. My great uncle, and namesake, was Sheriff in Lawrence County., elected in 1941. I have the key to the now gone jail. I also have his badges and many story’s of New Castle’s past.I have many old papers and items from this. Interesting. I wonder if he had any entanglements with anyone I’ve researched. Please let me know if you come across anyone on the site who you recognise from your great uncle’s files! This is pretty wild! 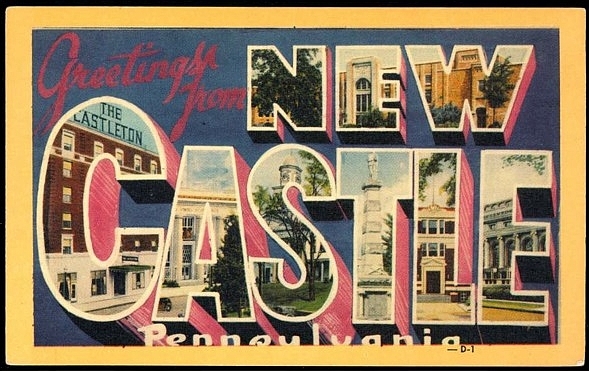 I am a new castle native, born and raised! Never thought anyone would be so interested in such a small town, nor thought it would be known overseas and researched! Great stuff! I love New Castle, but I really think that anywhere in the world will turn out to be fascinating if you manage to find a way to dig deep into its history and the lives of the people who lived there. It’s just pure chance that led me to your home town. Glad you like what I’ve written about it! Let’s not mince words, as a native of New Castle I am deeply offended by your projects. We writers who grew up and live in New Castle, don’t need you writing about our town. Nor do we need you waxing poetic on us. We, who actually know the place, are entirely capable of doing this on our own. Now for God’s sake, stop it, you’re embarrassing yourself. Sorry to have offended you, Blake. I understand that it can be annoying when an outsider appears to be laying claim to insights into a community that they’ve little experience of. People are always doing it with the city I live in, with varying degrees of success. I’ve tried to avoid doing that, but it can be hard, sometimes, to strike the right balance between, on one hand, informing the reader and, on the other, not implying a deep knowledge that I just don’t have. I try, though! I try! Thanks for getting in touch, in any case. I appreciate it. Blake, you are looking at it from a very selfish perspective. Sometimes it helps to have fresh eyes. Residing in a town for many years, you tend to get jaded and can certainly miss the nuances that someone new will pick up on. Frankly, you are laying claim to something that doesn’t really belong to you. I think you should lighten up and be honored that an outsider is taking an interest. Lets face it, New Castle isn’t a mecca and in many cases an outside interest can bring much needed attention to a community. My books are out there on Amazon, new covers and all. You have not offended anyone by your efforts to write about a very small part of life in NC. If one is offended by your writing, they would surely be offended by my novel. My novel is FICTION and I choose NC because I grew up there in a very transitional time in the late sixties. I was told by professional writers to write about what I know or, in my case, what I knew. I researched everything I could to make sure that all my information about NC was accurate. I used the NC Newspaper on-line archive and choose to tell it like it was. The topic of the novel is not New Castle, it just takes place there. There have been a few of my alumni who thought it was true, but it is only fiction. NC was only a vehicle to promote the theme of recovering from an abusive childhood. It could have taken place anywhere. Keep up the good work, Diarmid. This is a link to the Lawrence County Memoirs site which was created by Jeff Bales Jr.
Hope this will prove to be interesting to you and your readers. Don’t know if you have ever run across this guy in your research. The segment about the Black Hand was very interesting. That’s an excellent site, which I’ve returned to often during my research. I’ve always meant to put up a link to it on this blog, and I’m glad you’ve done it for me. At last! I just came upon your site. My father grew up in New Castle and I grew up in a small town nearby. I can’t believe someone threw this information away. I am glad that you put it on the internet. How did you come to have them? Do you still have more to put on your site? Hi Brenda. I’ve got a good few more still to come, and I’m always looking out for more. You can read the full story behind the blog here: http://theappendix.net/issues/2014/4/mug-shots-a-small-town-noir All your questions answered! This website is what makes the Internet great! Keep up the excellent work! Fascinating site,I couldn’t stop reading! Have you ever visited New Castle? Thanks, Melissa. I’ve been to New Castle a couple of times now. I love it. Hi Martin – Those ones from the 70s are most recent I’ve come across, so I think it’s likely that the police department didn’t throw out ones later than that (perhaps because they would still feature people who they might be likely to come across again). Who knows what will show up in time, though – will they throw out more in future years? Surely there would be no paperwork to dispose of with everything going electronic now-a-days. I’m sure that will be the case eventually, if not already, but I expect all the 20th-century mug shots will be real photographs. I am quite stunned by your site : I just discover it this morning (courrier international article) while I have been painting and drawing Newcastle (and other) mugshots for the last 5 years (!!). Dozens of them. First began with the Least Wanted book then bought them on eBay. Quite fascinating subject I must admit. I can send you some photos of the paintings if you wish. Was looking over your other website The Unsung Joe and read the Irving Cohen story and the follow up bonus screenshots page. Comments were closed there so I’m posting here. Spotted my uncle Joe Gray right next to Cohen in the ‘Criminal Court’ screenshot. They must have known each other, their filmography is very similiar, from Golden Boy right through Some Like It Hot. Joe knew Maxie Rosenbloom and Raft very well so they must have hung out in the same circles in Hollywood. Interesting story. Thanks for taking the time to comment here! I bet there are some great stories about those guys. Interesting stuff. I just found this site. I love it! I grew up in New Castle and still have friends and relatives there. I will be following and can’t wait to read more of the accounts. Will check out the other site too, The Unsung Joe. Maybe you’ll come across someone you know – let me know if you do! I was wondering if you had any information on the murder of Floyd Ross in the seventies or eighties? Great Blog. I am from New Castle and go back home often, found the stories entertaining and recognized many surnames. Wondering if you are considering writing a book? Excellent! It’s great to know that people across the world find these lives interesting. I can’t help but wonder what these people would have said if you’d told them that, in the 21st century, people in places like the Netherlands would be reading about them. Thanks for writing, Remco! Diarmid – Many thanks for this blog…I have to admit that I look forward to your monthly installments. Thanks, Deborah. I absolutely recognise what you say about people from New Castle being mystified about why you’re there — whenever I’ve visited, people can never understand why I’d want to spend time there when I could far more easily get to Paris or some other interesting European city with thousands of years of wonderful history to absorb. What can I say? I think New Castle is fascinating. And I bet it’s a great place to live, too. The Lawrence County Historical Society just put the book funding announcement on their Facebook page, so I came here after my payment (so excited). I love this idea, it’s just the type of thing that interests my husband and me. I come from a long line of family historians on each side (paternal and maternal), and one of my lines is from New Castle. I love reading the New Castle newspapers (the late 1800’s in particular). Thank you so much for sharing these stories. Thank you so much, Jean! Here’s hoping the funding campaign works out — it should be an excellent-looking book! I know what you mean about the late 1800s New Castle papers. They’re really entertaining, aren’t they? There were some first-rate writers on the staff back then, and the amount of detail they put into things like reports of trials is just astounding. I find it really interesting to read the differences between the decades. The reporting went through the salacious, gossip sop to some good research! And as a researcher I’m particularly happy that eventually married women had proper first names when noted. My great-grandmother’s parents both died when she was about 6, I guess. She left a note with partial names, remembrances, etc.and I finally solved a lot of that mystery two years ago. ‘Jake’ Kaufman, her grandfather, used to go down to the editor’s office and get a small mention here and there about his giant vegetables. His obituary was an amazing tribute. So nice to have something to connect to. And New Castle is to be commended for their archive work, truly! I just was at my parents house this past weekend and saw a story in their New Castle News paper about the book you are trying to make. I told my mom how I had been in touch with you before. Sounds like a wonderful idea. I hope it comes to pass. I come from a small town in Pennsylvania called Shamokin and I think that this project is simply brilliant. I just pledged money so I will get a copy of your book when it is published. I had never heard of New Castle before this but it sounds very familiar to my hometown. Great job promoting this! I am very excited about the forth coming book! Thanks! I’m sure Shamokin has faced many of the things that New Castle has dealt with over the past hundred years. Never seen a mug shot from there, though! I’ll get in touch so you can send me your details. William E Jenkins……..Drunk……..Jan 3 1947……..Aged 23 Could you send me his mugshot ? I think this is my step father . Hi Georgia — I only just found this comment in the “pending” folder, where it must have been lying for over a year. Sorry about that! I’ll get that mugshot out of the files and send you a photograph of it so you can check that it’s the right man before I send it on. That’s a great idea, John. I’ll email you today. I am looking for information on Domenick Carusone (1888-1966). He lived in New Castle and was in prison in the 1930’s and 1940’s. Would love to know if you had a story or photograph of him! Hi Todd – I don’t have any Carusones in my collection (so far, anyway…), but I’ll keep an eye out for the name. I had a look on newspapers.com to see if I could find any stories, but all that comes up is the obituary in 1966. It’s strange that a New Castle resident being sent to prison wouldn’t make the local paper, but, then again, there are lots of mugshots in my collection that I can’t find out anything about. I’ll let you know if anything comes up. Hi Diarmid – I originally found these photos on Flickr, but came here looking for contact info for you. Great blog – love the stories. I’m retired law enforcement and current forensic artist, so booking photos are a great resource for me. When doing a composite sketch with a victim, forensic artists use booking photos to help people describe features of the suspect in their crime. I also teach forensic art. To do this, I need good quality booking photos for students to use as resource photos. Of course I don’t want to use any recent photos for privacy purposes. I’d like to use some of the photos you’ve got here. Is that possible? Do you have restrictions? I’d be glad to credit you. Thanks! Hi Natalie – No problem at all! I’m glad to know the pictures will have yet another afterlife. I looked up your website (here, in case anyone reading this is interested), and your work is fascinating. Hi Gwen — Yes, there’s some tantalising details out there about a few of these folk, but only bits and pieces… It can be quite frustrating! I like this site but love The Unsung Joe. I have a huge (my wife thinks bizarre) interest in British film extras such as Fred Woods, Victor Harrington and Guy Standaven) Will you ever post on the Unsung Joe again? Hi Marcus — thanks for writing. I don’t think it’s likely that I’ll regularly do more Unsung Joe posts, but I always check out the extras when I’ve watched an old film, and I’d definitely write a post with any interesting stuff I came across, so sign up for notifications! Glad you like the stories, and thanks for letting me know. This is all about my hometown! I find it interesting that you’re fascinated about our town. What made you want to learn all about little old New Castle? If you ever get the chance to visit again, the town is slowly improving and slowly growing. Hi Kelsey. I’m glad to hear what you say about New Castle, a place I love dearly. The full story of my accidental entanglement with the town can be read here: http://theappendix.net/issues/2014/4/mug-shots-a-small-town-noir Thanks for writing! Diarmid – Please be sure to let us all know if you ever plan to return to New Castle. We’d love to have a party for you. That would be great — I’ll do that! Is there going to be any mention about the New Castle Torso murders that were never resolved? It sees that there was plenty of crime going on in that town at the turn of the century. I have read several books about The Butcher of Kingsbury Run in Ohio and some authors have speculated that the same killer has struck in New Castle; do you have any ideas regarding those strange crimes that occurred near the railroad tracks? Hi Robert — Believe me, if I ever come across a mug shot of someone who has even the merest, most tangential and flimsy connection to the torsos that were found in what the town came to call “murder swamp”, I’ll be on it like a shot. I’d love to have something about that strange case on the website. For what it’s worth (not much, obviously!) I’d be willing to bet that the first bodies were related to organised crime turf wars during prohibition. The later bodies might be connected to that, too, or it might be that once a place has a reputation for being a good place to lose a body, anyone with a body that they want to lose will take a trip out there. My family hails from the New Castle area. Actually Neshannock, which is right next door. They emigrated to the US back in the late 1930’s. In the 1950’s the Mooney Brothers (sons of immigrants) had a successful Concrete and Trucking company, now closed down due to the same reasons that many other businesses in that area shuttered. One of the apocryphal stories of family history that was passed down was the day the Mafia came knocking on the doors of the Mooney Bros.Trucking Company. You may wonder why the Italian Mafia would be wanting to connect with an Irish family. Well one of the quirks of history is that my family is actually Italian. Papa Mõne was from Northern Italy, and had his name changed to “Mooney” upon landing in America. So the Mooney family from New Castle is actually a bunch of Italians. Unfortunately I don’t have a date or a year when this happened but if you come across anything in your records, I would love to know about it. Thanks for looking into it. The 79th family reunion is coming up, and while my Grandfather is no longer with us (he passed with his wife by his side 2 years ago at the ripe old age of 98) there should be other family members that remember the story and can perhaps add more detail. Sadly, none of them will be Mooney Brothers, as my Grandpa (Ralph) was the last of the brothers left alive when he passed. But no doubt many of the stories filtered down to other sons and daughters and they may know more about it. Hello Mr. Mogg I am from the Lawrence County Historical Society, and we are currently working on a crime exhibit for New Castle and the surrounding area. Seeing that you have done a fair share of research we would be very appreciative if we could collaborate and possibly share some of your sources and documents that may help with our current research. Cheers! Hi Andrew – that sounds great. I’ll email you. Just came across your site and I’m fascinated. Both of my grandparents are from New Castle and lived there in late 1800’s – early 1900’s. My grandmother was Alice Bailey and I know she had many brothers (so perhaps related to your reports on Baileys.) My grandfather was Eugene Young and known in the town as “doc” as he was an optician and a jeweler. Glad I found your site and will stay connected to it. Good luck. I contacted you Sept 6 2016 about using some of your images in my forensic art workshops. I don’t see any other way to contact you except through this comment section. Can you email me regarding further permissions for some of these photos? Thanks! Of course – I’ll email you right now. Hi Diarmid! Heard about your website from Luc Sante who was my tablemate at a recent dinner at Bard College. When he asked where I was from and I said “a small town in western Pennsylvania, you’ve probably never heard of it”, he immediately directed me here. Thank you so much for doing this work, such an inspiration in my pursuit of narrative and experimental history! Hi Grace! That’s absolutely fantastic. Thanks for getting in touch, and I’m so glad you found the site inspiring in some way. It’s very nice to think about being discussed over dinner at Bard, I must say. I hope you enjoyed meeting Luc — one of my favourite writers! I can’t read the article, as the New Castle News site doesn’t allow access from Europe — incroyable! I’ll have a little dig around the archives and see what comes up. Might be an interesting lead — thanks! Diramid – Do you have an update on your book’s release? Hi Deborah. It’s a no-go on the book, I’m afraid. We managed to get about a third of the backers we needed to publish it, so we closed the fundraising campaign. You will have been sent an email from Unbound telling you that the campaign had ended and that you could get your money back, but you may well not have read it because, by that time, you had received loads of emails from them telling you about books you weren’t interested in, and you had probably started to automatically delete any Unbound email without reading it. Don’t fear — your money is still there, and you can get it back by logging on to the unbound website ( https://unbound.com ) and going to your account. Let me know if you need any help. Thanks again for supporting the book in the first place. I haven’t given up on getting it published one way or another. I hope you’re still doing well in New Castle! I don’t recall getting an email from Unbound. I don’t seem to remember my email address that I used, so at this point, it’s not worth hunting it down. How annoying for you! You should send Unbound an email. They seemed to be pretty helpful people. I’m sure it won’t be hard to get the money back that way. You should look into Lulu.com for publishing the book. Not sure if that would work for what you want to do, but I don’t think there is a cost unless someone orders it. Hi Liz – I’m pretty sure that would have come from eBay. I can’t remember who the seller was, but I’ll have a look and see whether there’s a record on the site. I’ll email you today. The James Grinnen and Robert Kirkwood you wrote of are both my Great Uncles. I had never heard this story before. Love the site… Keep it up. Thanks for writing, PJ. I didn’t know that James and Robert were related, so that’s interesting to hear. Glad you liked the story. Hi Cindy. Thanks for writing. I guess you’ve seen the “William LaRue Hill” story where I mention the Rea murder. What I say on that page is all I know about the murder, which is taken from the coverage in the New Castle News, which I suppose you’ve read. I have stories about Robert Grim and Francis Grim, too. I also have a mug shot with no story, of a guy called Norman Grimm (Details: Intox Driver…Aged 30…Nov 26 1940 … Aged 30) Are they relatives of yours?